Were Hedge Funds Right About Flocking Into First Data Corporation (FDC)? Looking for stocks with high upside potential? Just follow the big players within the hedge fund industry. Why should you do so? Let’s take a brief look at what statistics have to say about hedge funds’ stock picking abilities to illustrate. The Standard and Poor’s 500 Index returned approximately 13.1% in the 2.5 months of 2019 (including dividend payments). Conversely, hedge funds’ 15 preferred S&P 500 stocks generated a return of 19.7% during the same period, with 93% of these stock picks outperforming the broader market benchmark. Coincidence? It might happen to be so, but it is unlikely. Our research covering the last 18 years indicates that hedge funds’ stock picks generate superior risk-adjusted returns. That’s why we believe it is wise to check hedge fund activity before you invest your time or your savings on a stock like First Data Corporation (NYSE:FDC). Is First Data Corporation (NYSE:FDC) the right investment to pursue these days? Investors who are in the know are getting less optimistic. The number of long hedge fund positions retreated by 9 recently. However, hedge fund sentiment towards FDC is still near its all time high and has been in an upward trend since the fourth quarter of 2015. 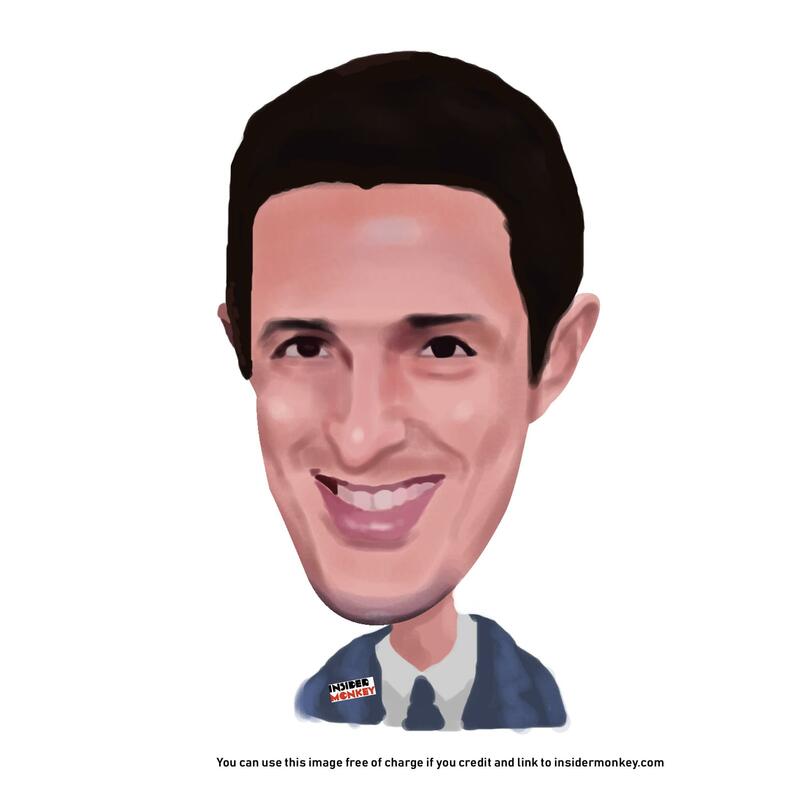 Let’s take a gander at the new hedge fund action surrounding First Data Corporation (NYSE:FDC). How have hedgies been trading First Data Corporation (NYSE:FDC)? At the end of the fourth quarter, a total of 52 of the hedge funds tracked by Insider Monkey held long positions in this stock, a change of -15% from the second quarter of 2018. 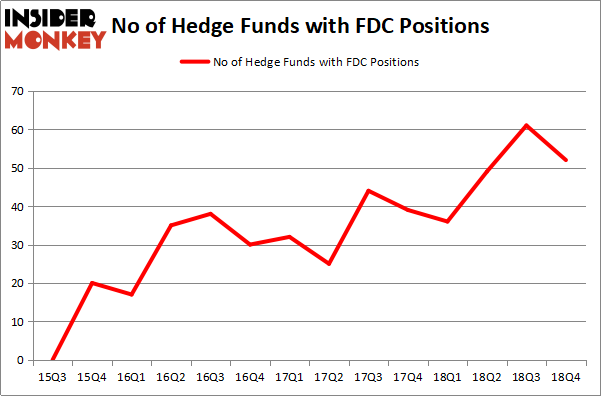 On the other hand, there were a total of 36 hedge funds with a bullish position in FDC a year ago. So, let’s examine which hedge funds were among the top holders of the stock and which hedge funds were making big moves. More specifically, Glenview Capital was the largest shareholder of First Data Corporation (NYSE:FDC), with a stake worth $435.9 million reported as of the end of September. Trailing Glenview Capital was Steadfast Capital Management, which amassed a stake valued at $325.2 million. Melvin Capital Management, Palestra Capital Management, and Senator Investment Group were also very fond of the stock, giving the stock large weights in their portfolios. Because First Data Corporation (NYSE:FDC) has witnessed declining sentiment from the smart money, logic holds that there is a sect of money managers who sold off their full holdings last quarter. Intriguingly, Stephen Mandel’s Lone Pine Capital cut the biggest stake of all the hedgies monitored by Insider Monkey, comprising about $536.2 million in stock. Louis Bacon’s fund, Moore Global Investments, also dropped its stock, about $91.2 million worth. These moves are interesting, as aggregate hedge fund interest fell by 9 funds last quarter. Let’s also examine hedge fund activity in other stocks – not necessarily in the same industry as First Data Corporation (NYSE:FDC) but similarly valued. We will take a look at Barrick Gold Corporation (NYSE:ABX), AmerisourceBergen Corporation (NYSE:ABC), AMETEK, Inc. (NYSE:AME), and Ball Corporation (NYSE:BLL). This group of stocks’ market caps resemble FDC’s market cap. As you can see these stocks had an average of 33.75 hedge funds with bullish positions and the average amount invested in these stocks was $672 million. That figure was $2230 million in FDC’s case. Barrick Gold Corporation (NYSE:ABX) is the most popular stock in this table. On the other hand AMETEK, Inc. (NYSE:AME) is the least popular one with only 32 bullish hedge fund positions. Compared to these stocks First Data Corporation (NYSE:FDC) is more popular among hedge funds. Our calculations showed that top 15 most popular stocks among hedge funds returned 19.7% through March 15th and outperformed the S&P 500 ETF (SPY) by 6.6 percentage points. Hedge funds were also right about betting on FDC as the stock returned 50.6% and outperformed the market by a huge margin.